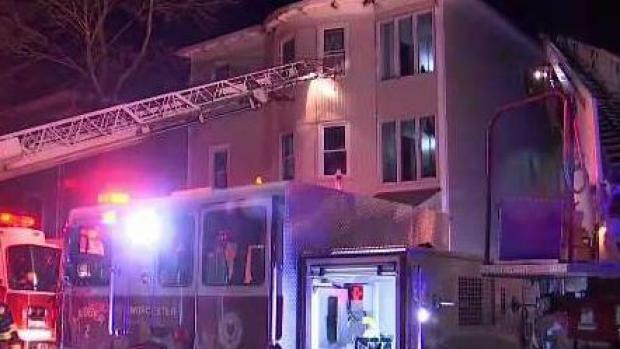 Crews are trying to figure out what caused a fire at a Worcester triple-decker. Seven people were hospitalized Tuesday after a 3-alarm fire ripped through a Worcester home overnight. The blaze was reported at about 2 a.m. at a home near 77 Merrifield St., according to fire officials. When firefighters arrived at the scene, they found heavy smoke coming from the second floor of the multi-family house and people hanging out of windows. Crews were able to knock down the blaze and rescue five people via ladders, according to Worcester Fire Department Andrew White said. One resident said she and another man were asleep and woke to smoke filling their bedroom. 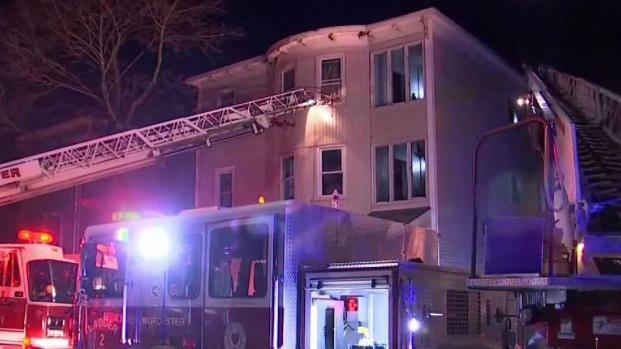 Seven people were rescued and 7 were taken to an area hospital after a fire broke out at a home in Worcester, Massachusetts Tuesday morning. "We had earplugs in," Melissa Giedraitis said. "It wasn't from the alarm, there were no alarms going off." Giedraitis said she and the man were able to flee the building in time. After escaping safely from the flames, the tenants were later allowed to go back inside the building to fill laundry baskets with personal items. Neighbor Margarita Rivera said heat from the roaring blaze cracked her windows. Fourteen people were displaced in the blaze. The building previously housed those residents in eight units and now, tenants are being assisted by the Red Cross. Authorities did not detail the extent of the injuries the seven people who were hospitalized suffered but said three of those people sustained serious injuries. 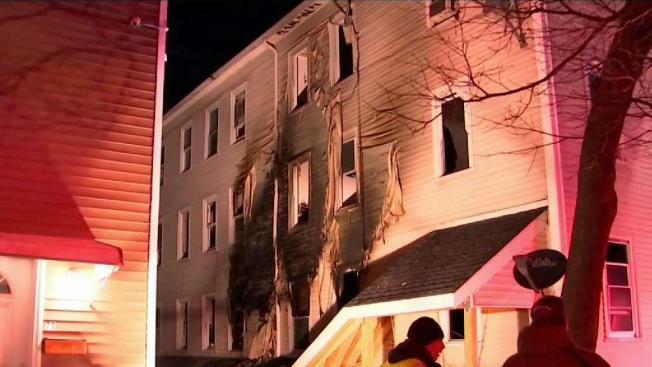 Seven people were rushed to the hospital and a total of 14 people are displaced after a 3-alarm fire at a multi-family home in Worcester, Massachusetts.